What caused Haiti’s cholera epidemic? The CDC’s museum knows but won’t say. One of the several key facts this map fails to note is that three months earlier there had been zero diagnosed cases of cholera in Haiti. In fact, there had never been a diagnosed case of the disease in that country before. More on that in a bit. Snow surmised this must have had something to do with the outbreak. Shortly after, a local Church of England minister named Henry Whitehead set out to disprove Snow’s theory. (The reverend was fond of the bad-smells and wrath-of-God hypotheses.) Instead, he wound up proving it when he learned that a local woman whose baby had died from cholera had thrown its soiled diapers into an ancient waste pit that seeped into the adjacent pump’s well. A little later, everyone else in the neighborhood had started getting sick. Armed with the map and the information, Snow theorized, correctly and for the first time, that cholera was a disease caused by microscopic organisms transmitted through dirty water, simultaneously creating the germ theory of disease, epidemiology, and modern public health. You know, no big deal. So whoever put it together must have known that this little map from London and the big map of Haiti had something important to do with each other—namely, that they both pointed to the source of a cholera outbreak. You can see it if you look closely. It’s the spot with the earliest date next to it, right next to the blue river that has all the other early cases clustered downstream. Yet the map on display makes no particular mention of that spot. There’s no highlight around it, no explanatory blurb, no special color, no icon akin to the one on Snow’s map. 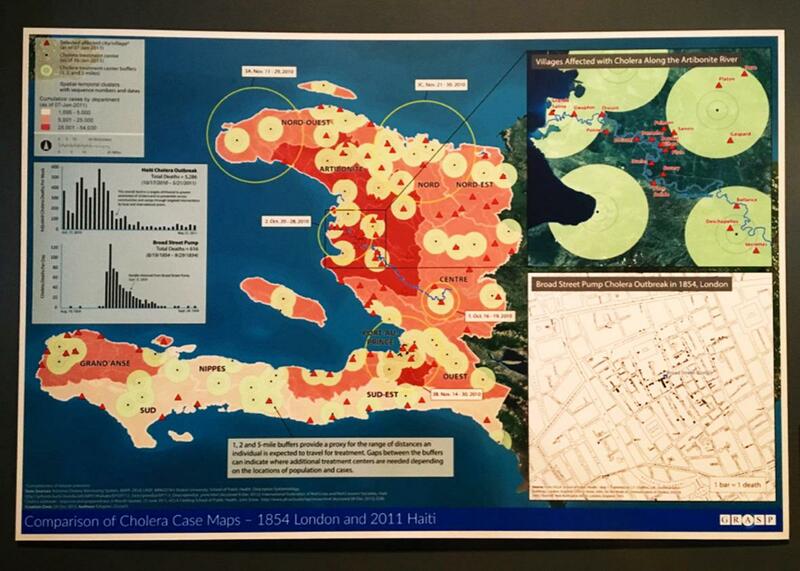 The inset in the top right, which purports to show “villages affected with cholera along the Artibonite River,” doesn’t even include it. However it happened, from that very spot, that cholera strain—the same strain found in Nepal, which had never been seen before in Haiti, ever—spread throughout the country. By January 2011, the date given for the map, it had been well-established—mainly through my reporting and the work of French epidemiologist Renaud Piarroux—that this was the case. Since the first days of the epidemic, the U.N. has tried to cover up what it did. 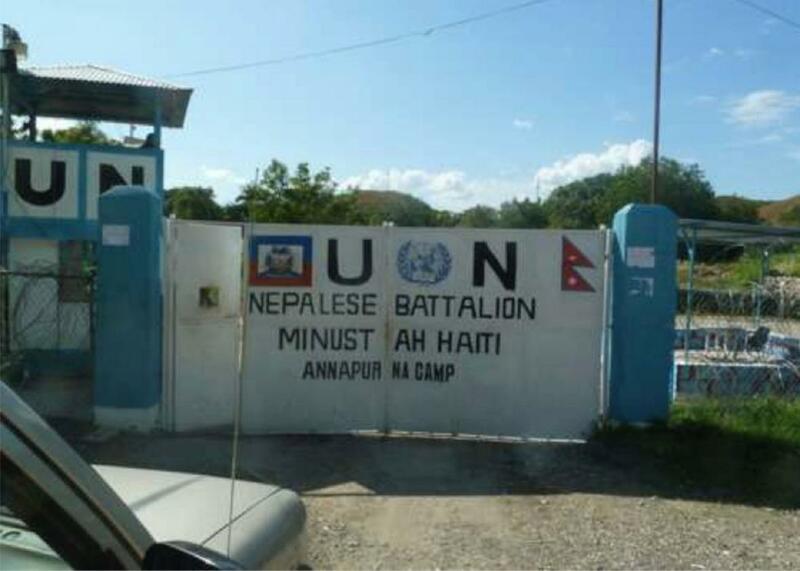 Everyone from the soldiers on the base to Secretary-General Ban Ki-moon has been implicated. The Obama administration and the U.S. government did not want the U.N. to be held accountable, because doing so might persuade other people elsewhere to hold U.S. peacekeeping missions accountable—and because the U.S. foots about a quarter of the U.N. peacekeeping budget. The CDC, a U.S. government agency, discouraged journalists from asking about the epidemic’s origin, telling them that pinpointing the source, Dr. Snow–style, was “not productive,” “not central,” and would likely never happen. Its epidemiologists did provide a key detail early on, when they identified the strain in Haiti as having a recent South Asian origin—meaning it could have come from Nepal and not from South America, Africa, or anywhere else cholera was circulating at the time. But after that, the CDC refused to take environmental samples from around the base or test the soldiers during the small window when doing either would have been worthwhile. All of this detailed in a damning new book by Ralph R. Frerichs called Deadly River: Cholera and Cover-Up in Post-Earthquake Haiti. CDC had ignored its own standard procedure by using the “first confirmed case” in its Haiti Cholera Outbreak map of mid-February 2011. It based the onset time on laboratory confirmation, which falsely implied that cholera had first appeared on October 21 in downriver Artibonite département, then two days later in Ouest département, and finally a day after that, October 24, in upriver Centre département—findings entirely different from Piarroux’s and the Haitian public health team’s. 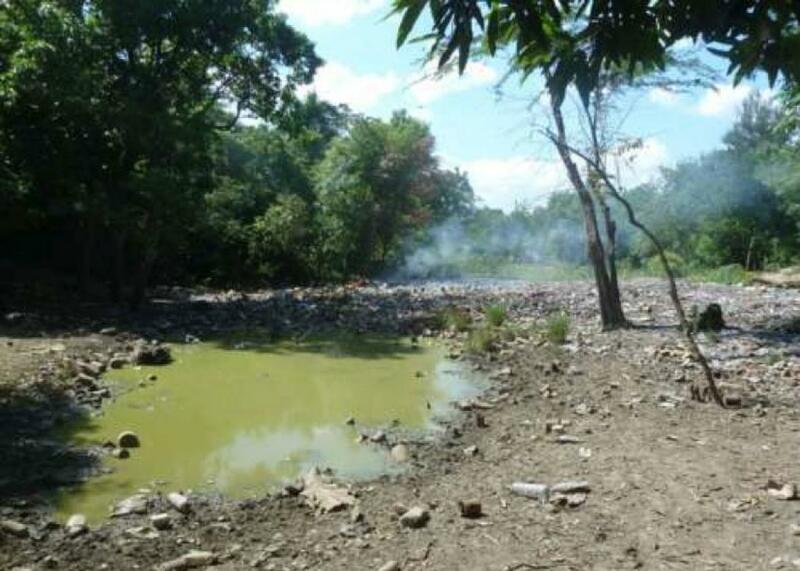 A pool of U.N. peacekeepers’ feces, across the street from the base and a few yards from Haiti’s most important river system. Piarroux suspected that CDC had released the map in anticipation of the UN panel’s arrival in Haiti and was helping the UN shift attention away from the Nepalese peacekeeping base in Centre département. Implying that cholera had started elsewhere served that purpose. It was the first in a series of online maps from CDC that used the poorest available measure to show when cholera had first appeared in Haiti’s ten départements. The CDC information remained widely circulated through updates in September 2011. Since then, the CDC has made a few more quiet admissions. In July 2011, its peer-reviewed journal, Emerging Infectious Diseases, published an independent paper by Piarroux’s team laying out evidence that the U.N. peacekeepers brought cholera to Haiti, with a standard note that it did “not necessarily reflect” the agency’s official position. CDC officials have occasionally cited that paper in technical writings, couched in conditionals. The agency’s public page on the epidemic does not make any mention of its cause. In fact, the epidemic continues in Haiti. Neither the U.N. nor its donors are anywhere close to raising the $2.27 billion it says is required to build the clean water and sanitation infrastructure needed to end it. Meanwhile, a lawsuit against the U.N. itself, in which Ban and Mulet are named defendants, is wending through U.S. federal court. The U.S. Justice Department has appeared at each session to argue on behalf of the U.N., against the Haitian victims. All of which probably explains why, at CDC headquarters today, five-and-a-half years into the epidemic, they are proudly displaying two historic maps that have everything to do with each other, but they are not telling you why.